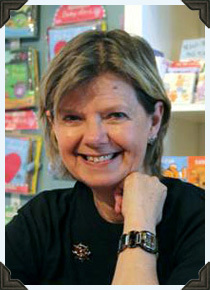 Julie Lawson is the award-winning author of many books for young people. Her three novels for Dear Canada have been acclaimed by readers of all ages. A Ribbon of Shining Steel was nominated for both the CLA Book of the Year Award and the Hackmatack Award, No Safe Harbour won the Hackmatack Award, and Where the River Takes Me was a runner-up for the Bolen Books Children's Book Prize. Julie has a personal connection with each of these novels. One of her grandfathers, a Swedish immigrant, worked for the CPR from the time he arrived in Canada until his retirement, and her other grandfather, a multi-generation Nova Scotian, was a patient in a Halifax hospital on the day of the explosion. Both novels allowed Julie to delve into the history behind many of the stories she'd heard as a child. Her third Dear Canada is largely set in HBC's Fort Victoria, the birthplace of the city where she was born and raised, and now makes her home. Her most recent novel Ghosts of the Titanic was released in Spring 2011. Check out Julie Lawson's other books. I was thrilled to be asked to write a novel for this series, specifically on one of my favourite subjects — the history of the CPR. A daunting task — how to write a novel about the CPR in the form of a diary that covers only a year, in the voice of a young girl, with historical bits seeded throughout in a believable way? Challenging? Yes, but I've always enjoyed a good challenge. Rewarding? Absolutely. I loved writing A Ribbon of Shining Steel. So much so that the day it was launched I was pitching a new proposal to my editor. And even before No Safe Harbour was published I was jotting down ideas for a third Dear Canada title. The girls in these books became my girls and still live on in my mind. Especially Charlotte, who turned out to be the most like a twelve-year-old me. One of the best things about writing a Dear Canada book was knowing that I was putting my girls and their stories into the trusted and capable hands of Sandy Bogart Johnston and the rest of the Scholastic team. I see the series in every library and school that I visit, and know of countless young girls who have received the books as gifts — often from adults who read them first. Many girls have read every book in the series. Boys like them too. The series is so widely known and respected it's an honour to be a part of its success. I love receiving letters and reading the comments on the Dear Canada website saying how much a particular title or character has meant to a young reader.